Dr. Amedeo, Dr. Joe, Dr. Adolph, Grandpa Andrew, Dr. Albert and Dr. Andrew. “My dad always taught me to take care of people the way you take care of your family,” explains Dr. Mike Magliolo. Though new to the Houston Methodist St. John Hospital team, Dr. Mike (as he is called by his patients) is a well-known gynecologist in the Bay Area who just happens to know a thing or two about family. A second-generation American doctor, Dr. Mike comes from a long tradition of family health care. His father and four uncles were all doctors in practice before he joined them in 1980. It’s hard to believe that such a rich history of medicine started in a humble barbershop in Sicily before the turn of the century. 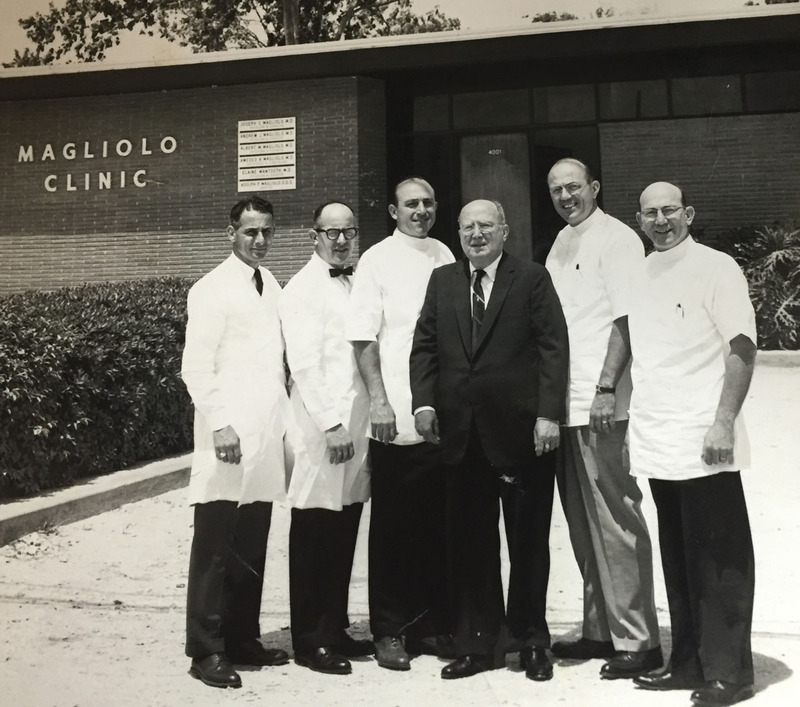 Dr. Mike’s grandfather, Andrew Magliolo, began work as a barber in Sicily at age nine by standing on a box crate to cut hair. At that time, people would visit a barber to have their teeth pulled, wounds sutured and other minor medical procedures done. Andrew dreamed of owning his own barbershop and in 1905, he boarded a steamer ship to Galveston with the $50 he saved and the promise of a job. When he arrived in Galveston, he knew only two words in English: “thank you.” He began working in a barbershop and learning his new language. His boss at the barbershop soon became his brother-in-law and before long, Andrew started his own family and his own barbershop on the corner of 25th and The Strand in the Panama Hotel in Galveston. Andrew and his wife had seven children, two girls and five boys. Four boys graduated from UTMB medical school. Dr. Mike followed in their footsteps, graduating from UTMB Medical School in 1976. The fifth son chose a dental health career and graduated from UT dental school. Only Dr. Joe, the oldest, was spared from WWII as he was the only doctor in Dickinson and considered essential to the community. All of the other boys were drafted and served their country. They all returned home safely and together opened the Magliolo Clinic in Dickinson. Dr. Mike followed in his father’s footsteps and became the second obstetrician-gynecologist in the office. Debbie Davila, Dr. Mike’s office manager, has enjoyed seeing the many generations of moms, daughters and now granddaughters that have come through for care. Dr. Mike married his high school sweetheart, Diane Dues, whom he’d known since he was 2-years-old. One of his favorite stories is when Diane’s mother went into labor while giving a baby shower for another one of Dr. Mike’s family members. She drove herself to the clinic where Dr. Mike’s dad, Dr. Amy, met her. As this was her fifth child he knew the delivery wouldn’t take long. He drove her directly to the hospital to deliver the baby. Back in those days insurance wasn’t required and patients didn’t always have the cash, so the Magliolo’s were used to bartering as a form of payment. Mr. Dues paid Dr. Amy with a set of new tires for safely delivering his baby girl. To this day, Julie Dues-Masters is the longest running mayor of Dickinson, but Dr. Mike and Diane like to humble her by reminding her of her beginnings. “When she gets out of line we like to remind her she’s just worth a set of tires to us,” laughs her older sister Diane. Dr. Mike and Diane have two grown boys. Corey lives in Dickinson and is a financial advisor and Paddy owns his own meat processing company in Schulenburg. When asked if he’s disappointed that his boys didn’t go into medicine, Dr. Mike was quick to answer. He is also glad that both of his children have continued the Magliolo tradition of involvement and support for their communities. “It’s important that people in a community are there for each other,” said Dr. Mike.